On Wednesday the 17th, we reluctantly checked out of the Elizabeth Street Inn to start our homeward journey. My heart always hurts a little bit when we leave Oregon – it’s a wonderful place, whether you’re on the coast or in the high desert. Or anywhere, for that matter. We made a brief side trip back to the town of Seal Rock, which we’d passed on our way south two days before. We’d noticed a woodcarving shop with a big sign that said BEARS there. John and I have always wanted a wooden bear. Not a big bear, like the eight-footer that stands outside our local Famous Dave’s BBQ joint, but a wooden bear that could, perhaps, sit outside on our front stoop, or maybe on our deck. Anyway, we decided to duck back down to Yachats and see what we could find. We parked in the gravel lot by the woodcarver’s shop and had a look at the bears outside (all too large) before moving into the shop itself. We could hear an electric saw running somewhere nearby but there was no one in the shop, although there were plenty of smaller bears. Many were the size we wanted, but we really wanted a bear with its paw raised in greeting, and these bears were doing everything else. After a bit the saw sounds stopped, and we were joined by Karl Kowalski, who had been working on a sculpture in the back. He and I chatted about his work, and John wandered off. After a minute he called me outside, where a new sculpture had been added to the ones outside. “I just finished carving him and put him outside to dry,” Mr. Kowalski said. 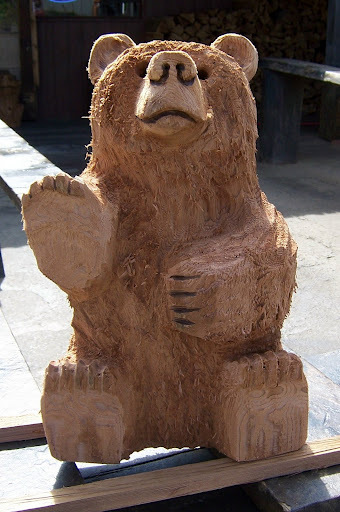 The bear was about a foot and a half tall, carved of red cedar, with a winsome expression and the all-important raised paw. In other words, he was perfect. The bear wasn’t finished yet (he would still have to dry before getting a finishing coat and some eyes), but we bought him anyway, and Mr. Kowalski says he’ll be shipped to us in early July. 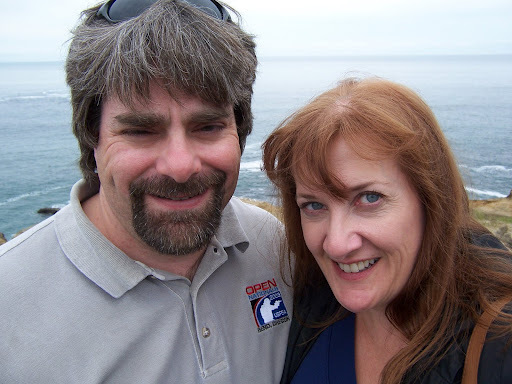 So we’ll have a little piece of the Oregon coast in a few weeks. The receipt from our bear purchase tucked away securely, we took a few moments for a quick farewell paddle in the ocean, then pointed the car to I-5 South. 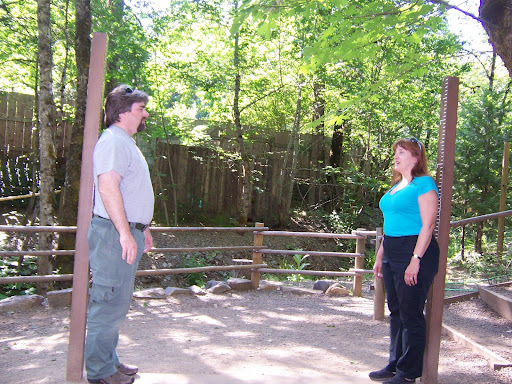 Our ultimate destination for the day was Redding, California, with a stop at what we were sure would be the cheesiest of tourist traps – The Oregon Vortex and House of Mystery. It took a while to get there. We had to get off I-5 between Grants Pass and Medford and make our way down some narrow backwoods roads that finally ended in the parking lot of the attraction. We were surprised to find quite a few cars there. We parked, paid our admission and were invited to join a tour that had just started. Now, all of us at one time or another have been in “mysterious” crooked houses, where the laws of gravity seem to go awry. There was a great one at the now-defunct Opryland theme park called The Angler’s Inn (my youngest sister Joan worked there way back when, as did fellow actress Sherri Edelen). 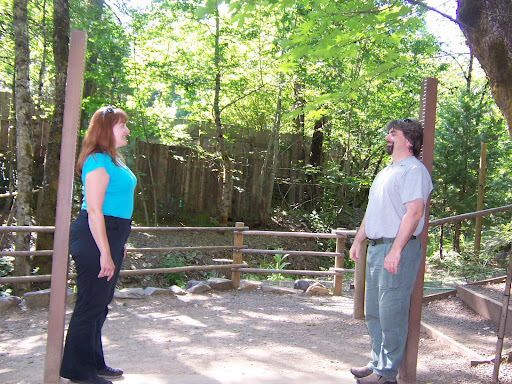 But the people who work at the Oregon Vortex sort of pooh-pooh the House of Mystery. They remind you frequently that the House is not the Vortex; it just happens to be in the Vortex. According to the guides, the House was an mining office built in the early 1900s, which slid off its foundations a few years after its construction. The Vortex, however, has been here for a much longer time. See what’s happened? I should note that we took this with the timer on our camera, and the camera was in the same pace for both shots. Now I know someone is going to come along and debunk this with physics and perspective and talk of Ames Rooms, but all I can tell you is that it’s super weird. It would have been fun, too, except that almost immediately upon entering the area I got a headache and felt slightly nauseated. I don’t know what that was all about, but about half an hour down the road after we departed, I felt better. All the same, it was a funky good time. 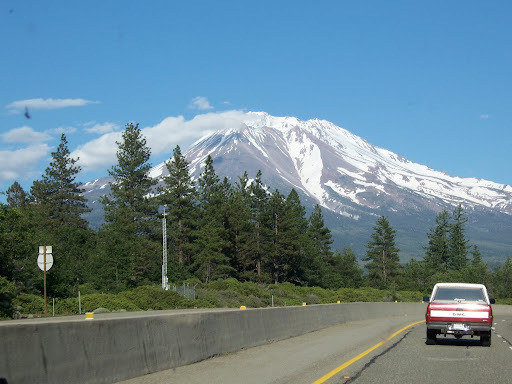 Before long we saw Mount Shasta looming in the distance, and we crossed into California. We passed Shasta Lake, which seemed very, very dry (I found out later that the water level is, indeed, quite low). Eventually we pulled into our hotel in Redding, an old-fashioned two-level motor lodge with an outdoor swimming pool. We hadn’t been there an hour when the power went out. Appparently a bird had flown into a nearby transformer. It was hot outside and without air conditioning, it rapidly grew hot inside as well. People propped open the doors and windows of the room; men took off their shirts and stood outside smoking by their trucks. It looked like a scene from My Name Is Earl. I didn’t help matters by standing barefoot in the doorway of our room, filing my nails (the outage occurred when I was in mid-manicure). Eventually it got so dark outside that there was nothing to do but lie in bed and hope for a breeze. Fortunately the power kicked back on after an hour and a half, and we cranked the A/C down and went to sleep, dreaming of the ocean breezes we’d left behind. Very interesting..I felt like I was there….much fun! July 16, 2009 - 5:17 pm Joan L.
It was actually the Angle Inn, not Angler's Inn. I still remember quite a bit of the spiel:"Hi folks, my name's Bobbie (because the paintings called you Bobbie, you had to switch your real nametag with one that said Bobbie) and I'd like to welcome you all to the Angle Inn, which we like to call the Tiltin' Hilton." July 16, 2009 - 5:20 pm Joan L.
I should clarify, the paintings talked. They had blank mannequin faces onto which film footage was projected. One of our favorite things to do was to "accidentally" knock the projector off center so we could close the attraction, call the exceedingly slow maintenance staff to come fix it and take a nap. It was the only place you got to work in the Western area that had air conditioning, except the bathrooms.